Perhaps Dan Riehl qualifies as a "conservative blogger" in some sense, but not in any sense that matters to me. If you're willing to dispense with the idea of not calling for the death of the injured wives and children of your political foes, you've already walked away from everything I ever wanted to conserve. In his comments section, Riehl justifies himself: "I've been watching you high-minded twirps get your lunch money stolen by the Left for years." That's not true: who won the fight on Iraq, and on holding out in Iraq long enough for the good to come? It was those who fought with honor, and who by honor won the victory both here and in Iraq itself. 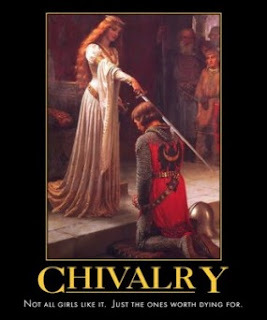 We sometimes fought hard, against our foes; we didn't wage war on their wives and children. Yes, the opposition does; we've seen just such war waged on then-Governor Palin and her children. Perhaps in part due to such tactics, Obama won an election. That happens; you can't win 'em all. Neither Obama nor his allies nor his policies will last more than a brief season -- if he manages to enact any policies at all. His ideas were exhausted when he arrived, and they have already been broken by the change in economic fortune. These policies are in rapid retreat across the world. This is the end of the age of his kind; you will soon see the last of them, whatever you do. Lots of the commenters reference Alinsky in support of Riehl's tactic. That's mere power worship, to say that it worked once, and therefore we "must" follow to compete. We need not. What will win the next election is the economy and the cancer of Federal spending promises; all the Alinsky tactics in the world will not save the candidate on the wrong side of that issue. Alinsky dedicated his work to Lucifer. Take him at his word, and take his word as a signpost as to where his road may take you. 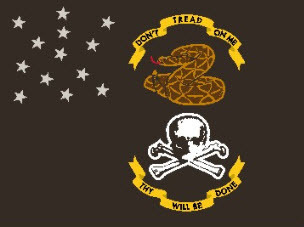 The Devil is granted an hour now and then, but that doesn't mean he's won the war, or that it's time to change your flag. Do what is right, and have faith. The Texas Board of Education drops Thomas Jefferson from its early modern political philosophy (folded into "social studies," in high school). They add in his place John Calvin, Blackstone, and St. Thomas Aquinas. Now, obviously the point of this is to play down the importance of the Enlightenment, and to restore the position of certain religious thinkers, and of the powerful heritage of traditional British law. That's OK: we are probably at the right moment to rethink the Enlightenment's place in our heritage, and to perhaps revise downward its importance somewhat. However, if you were going to do that, wouldn't you get rid of one of the other Enlightenment thinkers, given that you're teaching students who live in the United States of America? Does a citizen of the United States and the great state of Texas really need to know more about Charles de Montesquieu's thinking than he knows about Thomas Jefferson's? Really? Via Arts & Letters Daily, a story about working in the Arctic. If something happens, and you leave your vehicle, you will not be rescued in time. You do not leave the road; to leave the road is to die. You are given an orange safety vest, so they can find your body, in case you don’t listen. The road is usually a frozen river. To break through the ice and fall into the river is yet another way to die. Sometimes the road is the frozen-over Arctic Ocean. When you break through that ice, you sink. They say it’s the air bubbles in your decomposing body that cause it to float, and in the sub-freezing water of the Arctic Ocean, human bodies don’t decompose. If you fall into the Arctic Ocean, your corpse may be well-preserved, but no one will risk a life, or expend the cost, to retrieve it. Suppose you do fall in. By the time you reach the surface, the hole you fell into may have frozen over already. If you can punch through ice with lungs full of 35° water, maybe you deserve to live, but then you’re soaking wet in subzero temperatures, and you will spend your last few conscious minutes too delirious with hypothermia to be thankful that your next of kin will have something to bury. Once, I asked a guy who’d worked up there for twenty-five years if he’d known of anyone who’d fallen through the ice and lived. He could think of only two.... [one] rescued driver immediately went to the bar, where he wasted no time telling his story. A number of his listeners didn’t believe him and even took umbrage with the tale, at which point, the rescued driver became aggrieved, and a fight broke out. Less than twelve hours after he was submerged beneath the ice of the Arctic Ocean — a situation that no one in recent history had ever survived — the rescued driver was nearly beaten to death in a dingy bar. He was taken back to the same hospital he had just left, and this time, he was there for two months. The story about walking to the Post Office is amazing, too. The description of the place as resembling the Moon reminds me of FOB Hammer; and indeed, it suggests that someday we really will go places like the moon, or Mars, to live and work. We already do. Instapundit links this enthusiastic chef on cast iron cooking. Here at the Hall, I cook with little else. I have a few stainless steel pots that I use for things like warming sauces, but any serious cooking is done on black iron. I use it for roasts, steaks, etc., as everyone else does; but it also works extremely well for quesadillas and grilled sandwiches, any sort of frying, chili or stew, and so forth. A recent discovery: cast iron works even better than having a pizza stone for baking deliciously crisp pizza crusts. Make your pie up in a skillet, and bake it in the skillet. It comes out perfect every time. You don't even have to oil the skillet -- just toss a bit of corn meal in the bottom so nothing sticks. Gallup: more and more Americans think Global Warming is exaggerated. TWS: A five page report on Climate Change fraud and error. In Kentucky, if you don't vote for 'revenue enhancement', your district doesn't get school money. In Kansas City, bankruptcy concerns close half of the schools. The Economist has a five page article on the troubles in Europe. They call for a limited bailout, coupled with new regulatory powers that would keep Greece-type situations from recurring. Arts & Letters Daily interprets the article thus: "The Euro is finished." That's not what the article says; but it may very well be the truth. Arts & Letters Daily adds this and this to its reasoning. Couldn’t Mecca, I asked the royals, be opened to non-Muslims during the off-season? The problem with her being a print journalist is that there were consequently no cameras in the room. That would have been something to see. Bill Whittle, in rare form -- as he might be, speaking of one of his own. My brother Steve is a year younger than me. Right around age 13 Stevie used to take a tent, his dog and a shotgun and hitchhike from our home in South Florida out into the Everglades. He’d usually be gone or two or three days. Did my mom worry about him? Yes she did, but on some level I guess she preferred to raise an independent boy who was living his life to the fullest rather than perpetually trying to defend a life-long infant. A few months ago I heard in passing that Steve had been on his way to work one morning when he passed a car that was on fire with the driver still inside. He pulled over, grabbed his crowbar, smashed the window and with the help of another passing citizen pulled her out and saved her life. He never thought to mention this to me. Now that's the kind of boy a man could be proud to raise. I was visiting beautiful Athens, Georgia, today; and after I finished my business there I went to get some coffee. On approach to the coffee shop I noticed a homeless man sitting at one of the tables -- homeless, but with enough wealth to buy a cup of coffee, and therefore with every right to occupy one of their seats for a while. Just as I was passing by, someone in a nearby car leaned on their horn in displeasure. As they stopped, the homeless man yelled out: "This ain't New York City!" "Hear, hear," I said, and we exchanged a smile as I went to get my coffee. So, I put it to you: is this a wonderful thing about America, where even the homeless may buy dignity for the price of a cup of coffee, and chide the wealthy for their rudeness? Or is it a wonderful thing about the South, where being downtrodden does not mean that you will suffer poor manners? I suppose it could be both. I do have one mild comment, wherein my understanding differs from our learned friend: Germanic society had both "duels" and "judicial combats." The duel -- whereby two men settle an affair of honor -- was known in every such culture except, oddly, the Anglo-Saxons (see Henry Charles Lea, The Duel and the Oath, p. 111 & 115). The judicial combat was to settle the truth of criminal charges: also called "the ordeal of battle" (or "wager of battle), it was a final appeal to arms in cases where a man felt he was being handled unjustly by the law -- or in cases too serious for the swearing of oaths by even the most honorable men to be considered adequate evidence. Among the heathen Norsemen, indeed, the holm-gang, or single combat, was so universal an arbiter that it was recognized as conferring a right where none pre-existed. Any athelete, who confided in his strength and dexterity with his weapons, could acquire property by simply challenging its owner to surrender his land or fight for it. When Iceland, for instance, was in process of settlement, Kraku Hreidar sailed thither, and on sighting land invoked Thor to assign him a tract of ground which he would forthwith acquire by duel. He was shipwrecked on reaching the shore, and was hospitably received by a compatriot named Havard, with whom he passed the winter. In the spring he declared his purpose of challenging Sæmund Sudureyska for a sufficient holding, but Havard dissuaded him, arguing that this mode of acquiring property rarely prospered in the end, and Eirek of Goddolom succeded in quieting him by giving him land enough. Others of these hardy sea-rovers were not so amenable to reason as Kraku. When Hallkell came to Iceland and passed the winter with his brother Ketel-biorn, the latter offered him land on which to settle, but Hallkell disdained so peaceful a proposition, and preferred to summon a neighbor named Grim to surrender his property or meet him in the holm-gang. 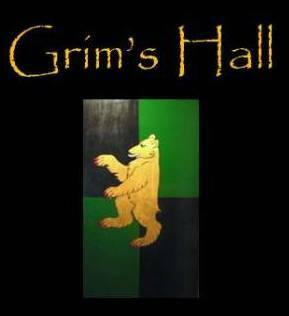 Grim accepted the defiance, was slain, and Hallkell was duly installed as his heir. This section goes on for about half a page, offering additional evidence; Mr. Walker alludes to it in his part three, where he speaks of a class of professional duelists who had so prospered. However, this was not the judicial use of combat: no one here was accused of a crime, or proving his innocence by ordeal of battle. In all cases, these fights were about settling a private dispute, not a public or criminal matter. Frangible Arms just bought a four page color ad in our next issue. They sent us their latest offering, the CQB MK-V Tactical Destroyer. I told Fred to take it out to the range to test. He’ll have the data for you tomorrow. The pistol is a crude copy of the World War II Japanese Nambu type 14 pistol, except it’s made from unfinished zinc castings. The grips are pressed cardboard. The barrel is unrifled pipe. There are file marks all over the gun, inside and out. Only 10 rounds of 8mm ammunition were supplied. Based on previous experience with a genuine Nambu, I set up a target two feet down range. I managed to cram four rounds in the magazine and one in the chamber. I taped the magazine in place, bolted the pistol into a machine rest, got behind a barricade, and pulled the trigger with 20 feet of 550 cord. I was unable to measure the trigger pull because my fish scale tops out at 32 pounds. On the third try, the pistol fired. From outline of the holes, I think the barrel, frame, magazine, trigger and recoil spring blew through the target. The remaining parts scattered over the landscape. I sent the machine rest back to the factory to see if they can fix it, and we need to replace the shooting bench for the nice people who own the range. I’ll be off for the rest of the day. My ears are still ringing. I need a drink. The CQB MK-V Tactical Destroyer is arguably the deadliest pistol in the world. Based on a combat proven military design, but constructed almost entirely of space age alloy, it features a remarkable barrel design engineered to produce a cone of fire, a feature much valued by Special Forces world wide. The Destroyer shows clear evidence of extensive hand fitting. The weapon disassembles rapidly without tools. At a reasonable combat distance, I put five holes in the target faster than I would have thought possible. This is the pistol to have if you want to end a gunfight at all costs. The gun is a keeper, and I find myself unable to send it back. Mr. Douthat, whom I first encountered only last week, has a most interesting piece on mysticism. Mysticism is dying, and taking true religion with it. Monasteries have dwindled. Contemplative orders have declined. Our religious leaders no longer preach the renunciation of the world; our culture scoffs at the idea. The closest most Americans come to real asceticism is giving up chocolate, cappuccinos, or (in my own not-quite-Francis-of-Assisi case) meat for lunch for Lent. This, at least, is the stern message of Luke Timothy Johnson, writing in the latest issue of the Catholic journal Commonweal. As society has become steadily more materialistic, Johnson declares, our churches have followed suit, giving up on the ascetic and ecstatic aspects of religion and emphasizing only the more worldly expressions of faith. Conservative believers fixate on the culture wars, religious liberals preach social justice, and neither leaves room for what should be a central focus of religion — the quest for the numinous, the pursuit of the unnamable, the tremor of bliss and the dark night of the soul. Yet by some measures, mysticism’s place in contemporary religious life looks more secure than ever. Our opinion polls suggest that we’re encountering the divine all over the place. In 1962, after a decade-long boom in church attendance and public religiosity, Gallup found that just 22 percent of Americans reported having what they termed “a religious or mystical experience.” Flash forward to 2009, in a supposedly more secular United States, and that number had climbed to nearly 50 percent. In a sense, Americans seem to have done with mysticism what we’ve done with every other kind of human experience: We’ve democratized it, diversified it, and taken it mass market. No previous society has offered seekers so many different ways to chase after nirvana, so many different paths to unity with God or Gaia or Whomever. He starts thus, but ends better: because his ending has a notion in it of what a mystic might really be. ...that at any time, in any place, it’s possible to encounter the divine, the revolutionary and the impossible — and have your life completely shattered and remade. What would that mean? None other than that "the heaviest hind may easily come silently and suddenly upon me in a lane," as Saint Mary is reported to have said to King Alfred. It has its clearest expression in the myths of Arthur, where a knight hears a bell deep in a forest, and follows its sound to whatever adventure it leads; or he sees a white stag, and takes the chase to whatever destruction or rebirth it brings him. The mystic is at the root of the tales of Arthur, more than elsewhere. It is, in other words, that singluar devotion to the chase: to the quest. It is that which leads you beyond the fields that you know, and to strange places that may remake you. That way lies Elfland; or stranger kingdoms, yet. To which St. George, in service to the Faerie Queene, might not yet ascend: for he had deeds to do in this world. People scoff at these stories, as they do -- a bit -- at C. S. Lewis when he wrote in The Lion, The Witch, and the Wardrobe of a professor who chided the children to use "logic!" when presented with the impossible. Lucy, the honest child, was the one who spoke of something that could not be; and her honesty should be a guide to the value of her testimony in the face of impossible things as well as with possible ones. In other words, we might yield up our ideas of what is possible in the face of the word of an honest woman, or even a very honest girl. Last week I attended a lecture on metaphysical modal logic by Dr. E. J. Lowe, who is a fine man and a learned. Modal logic treats what is necessary and what is possible in the world. The good doctor asserts that what is possible and necessary can be understood by grasping the essential truth of the thing being examined; if you know what a thing essentially is, you will know what is necessary for it to exist, and what it may possibly do. He mentioned bronze sculptures as an example. A sculpture is different from a lump of bronze in several ways; one of them is that its form may not change much if it is to continue being a sculpture. He contrasted a sculpture of Socrates, versus shooting two cannons full of bronze so that -- for an instant! -- they happened to form a similar picture of Socrates in the air. I had a chance to question him. He agreed to my suggestion that one of the essential qualities of a sculpture was that it was put into a form by an artist (or, if you follow Aristotle, that a form was put into it). I asked him to imagine a case where the two cannons were full of hot bronze, being fired by Jackson Pollack. He takes the largest fused piece, and puts it on a pedestal, calling it his sculpture. Randomness is not form: it is, logically, the opposite of form. Therefore, we are either mistaken in our definition of what is essential to sculpture... or our modal logic is lying to us about what is necessary and possible in this world. The good doctor argued that we should simply refrain from calling this "sculpture," in order to preserve the definition. That is the one unsatisfying answer. Both of the alternatives proposed are true: human definitions cannot really capture the world, and therefore a logic based on human definitions cannot tell us what is necessary, nor what is possible. Besides, Pollack's proposed definition of sculpture is contained within the definition: if sculpture means "having form," then it doesn't mean "without form." Pollack could draw the meaning from the negation of the definition. Modal logic, then, becomes not a proof, but a dare. "We say this cannot be done: prove us wrong." And so we ought to, if we can! Preserving the concept at the expense of our actual experience is a lie. It is what Edward Abbey called "Indoor Philosophy": it defies the world, because the world won't live up to our ideas about how the world should be. Yet the world remains: and the very honest girl is honest whether she reports the mailman, or an angel. UPDATE: Related is this article on certain philosophers versus Darwin's evolutionary biology. Philosophy is very powerful, and I'm sure all of you know how devoted I am to the art; but you should always start your philosophy with experience and evidence. You should never start simply with concepts, and then instruct the world that it is wrong to behave differently than your reason says it ought to do.